Hey, good news: Jerry Seinfeld is back on television. Well, it’s not really television, because it’s a webseries. But you can watch television on your computer now, which means that being on the Internet is basically the same as being on television. And he’s not making a sitcom like Seinfeld because this new show stars the real person named “Jerry Seinfeld,” not the fictional “Jerry Seinfeld.” So instead of Fictional Jerry having rambling conversations with people, you get Real Jerry doing the same thing. 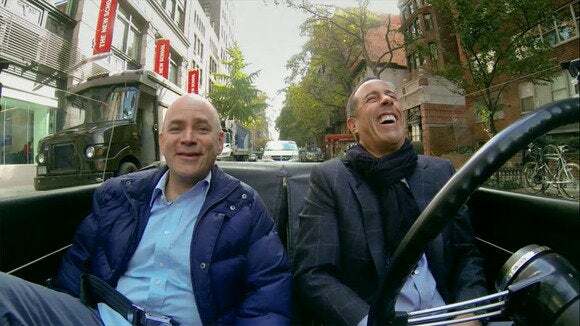 Crackle’s Comedians in Cars Getting Coffee is probably as close as you’re going to get to Seinfeld, what with Curb Your Enthusiasm being in some sort of between-season limbo. And the fourth season just last week, with new episodes appearing every Thursday. So it’s a fine time to jump in. If Mel Brooks (right) and Carl Reiner don’t want to go out to a diner, who's going to say no to them? Certainly not Jerry Seinfeld (left). Jerry Seinfeld drives a fancy car and goes for coffee with a famous person. That’s pretty much all there is to the show. The fancy car changes every episode, as does the famous person. If you like Jerry Seinfeld, there he is. If you like vintage cars, he’ll tell you all about the car he’s in. And if you like famous people (assuming Jerry Seinfeld isn’t famous, enough for you, which seems like you’re just being difficult), the guests include people like Don Rickles, Sarah Silverman, and Tina Fey. Let’s say you miss Seinfeld. If so, you will like the episodes where Jerry talks to Larry David, Michael Richards, and George Costanza. Yes, “George Costanza,” the fictional character, not “Jason Alexander,” the actor. It’s only six-and-a-half minutes long, but it’s Jerry and George at that one diner from the show. So that’s kind of something. Or, depending on your mood it’s deliberately weird. Setting that aside, it’s just fun to watch famous comedians talk to each other about what it’s like to be famous comedians. It turns out they spend a lot of time telling each other terrible jokes. I realize that sounds kind of awful, but it’s really endearing to see how much enjoyment they get out of that sort of thing. And even when you’ve been rich and famous for decades, you might have entertaining stories about bad gigs. These are people who have trained all their lives to be funny, so even when they’re not on stage, people like Joel Hodgson and Don Rickles are worth listening to. Incidentally, that might be the first time in history that Joel Hodgson and Don Rickles have been described as being the same sort of person. Behold, the majesty of an Austin-Healey, for people who like that sort of thng. The fancy cars also have an appeal, if you like weird old cars, shot from interesting angles. They’re usually referred to as “vintage” cars, but sometimes, they’re just peculiar. Like when Jerry drives David Letterman’s ridiculous Volvo station wagon, which has had a racing engine installed by Paul Newman as some kind of obscure joke. It doesn’t make any sense, and apparently the car overheats all the time, but it’s exactly the kind of meaningless gesture that makes Dave laugh. Well, you know how Seinfeld was about nothing? This is really about nothing. The conversations deliberately never rise much above chit-chat. No deep secrets are going to be revealed, and you’re probably not going to feel like you really know what these people are like when they’re not on camera. Not that this is necessarily a bad thing: Everyone in Comedians in Cars Getting Coffee is trying to be entertaining, and they succeed at it. Todd Barry may not be as famous as some of the other guests on Comedians in Cars Getting Coffee, but he's still quite funny. Honest. There’s also some intrusive advertising. The series is sponsored by Acura, even though Jerry never drives a car from that manufacturer. I guess there aren’t a lot of vintage Acuras to choose from. So that means about halfway through each episode, everyone has to make a big deal out of some Acura they’re driving near. It’s explicitly called out as product placement, but that doesn’t mean it stops being product placement. It just feels like overkill to start with a 30-second commercial, have another near the end, and also make the star of the show talk about how great this car he’s passing on the street is. It’s charming. Nothing of any great weight gets discussed, and the details of any given episode tend to drop out of your memory seconds after watching it. But if Jerry Seinfeld wants to hang out with famous funny people, there’s nothing wrong with watching that. One, which will give you three episodes. You could get through the entire series in about eight hours, but I think that would be too much. Frankly, after a couple hours, I’d probably get tired of talking to the actual Jerry Seinfeld. So I’d advise you to save it up. Occasionally dip in for three or so episodes, then get on with your life. Maybe get some coffee with a friend, although you’ll have to try not to get angry at them for being insufficiently hilarious. If you run out of episodes, consider watching RuPaul Drives, a somewhat similar show, except that Jerry Seinfeld is replaced by RuPaul, the comedians are replaced by an almost entirely random list of pop-cultural figures (including John Waters, Elvira, and Henry Rollins), and there’s no coffee. So it’s not really all that similar, except for the basic concept of the host driving around and asking questions.